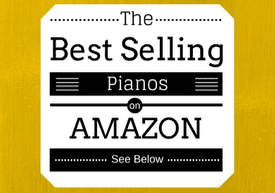 You are here: Home / Digital Pianos / What Is the Best Yamaha Upright Digital Piano? In this article, we’re going to examine what the best Yamaha upright digital piano is, and breakdown what some of the key features are for the top verticals on the market today. 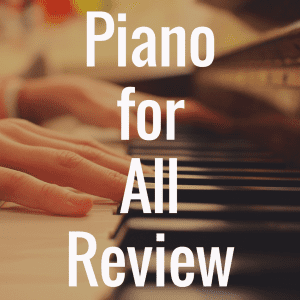 We’ll also explore why you’d want a vertical (or upright) piano, and make direct comparisons of specs, features, and price for the best selling ones. 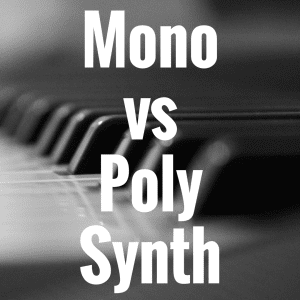 Now, in some of our previous articles, discussed the differences between digital pianos and keyboards. We’ve even discussed what might be the best Yamaha pianos on the market. But now, let’s explore the upright piano, as they have increased greatly over the years to the point that the models being produced now are of unbelievable quality, material and technology. I would only stop short of saying that they are better than the real thing because nothing can truly be greater than the classical form, shape, and functionality of a real upright piano. But, if you buy one of the pianos that we’ll discuss in this article, there is little doubt that you’ll be getting a well-made instrument that will do a very nice job of simulating the look and feel of a real acoustic piano. Before we move forward, we encourage you to take a look at our interactive table below. There, you’ll see a handful of quality Yamaha uprights that can be compared based on price, weight, average customer review ratings and more. Yamaha is one of the more dependable manufacturers of vertical digital pianos, so when dealing with this exact topic, it would be understandable to start right there with this famous company. Yamaha’s instruments are engineered mostly with the greatest care and attention to detail, not only with their uprights, but also with their slabs, consoles, and portable keyboards. Yamaha has also made a major statement in the upright piano industry with their exquisite ARIUS line of pianos, which really push the bar as far as the expectations for this specific class of pianos, and it has served the industry as a whole greatly. My hope is that Yamaha will continue to not only raise the bar, but continue researching opportunities to improve upon what they have while still looking for chances to create something new. Upright pianos are special for a number of people because they are meant to replicate a real piano that is unique and produces an amazing sound. 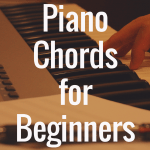 People who look for uprights are mostly going to be serious or more advanced piano players who are looking for a platform to either practice on and bring into their home or some other environment. Because they are digitally mastered and do not have all the drawbacks of a real machine, they can greatly cut back on the amount of size and weight that they have to maintain with the piano. Most of the time, they will still keep many of the general and traditional shape. Yamaha’s upright pianos are undoubtedly beautiful and well put together. They feature the standard cabinet that most digital uprights have, and the body always comes in an impressive number of beautiful finishes and colors. Some of the finishes they offer are Black Walnut, Dark Rosewood, Mahogany, and Polished Ebony. They are all very beautiful and it is hard to say that one is better than the other, so you’ll have to look for yourself to decide which one is the best fit for your home or studio. 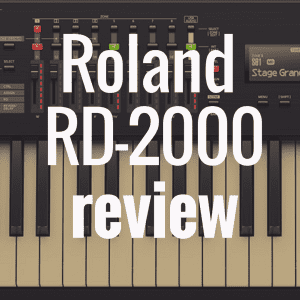 It is also easy for the console digital piano to easily get lumped in the same category as the upright, which is understandable, so their shape and size must also be discussed. Consoles don’t always sit as high as the uprights, and have a little bit better shape. Some of the most well known consoles also come from Yamaha, in the Clavinova series. Clavinovas are known all around the world, and their design and shape are signature pieces for such a successful company. 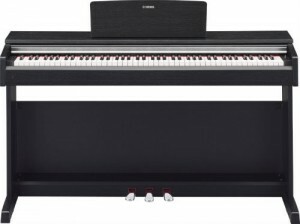 The engineering behind the upright and console digital pianos offered by Yamaha are comparable with any other type of piano offered by the company. It all starts with the hammer action key systems provided by Yamaha. These key action systems are the most essential parts of the piano, as they really make the digital piano truly comparable to a real piano. They feature hammers, piano sticks and sensors as part of the mechanism that makes the keys act like the way they would on an actual upright piano. Yamaha has so much expertise to choose from, as they have produced scores of actual upright pianos which are also highly sought after, and which are used as real samples in the tone generation sound engines. 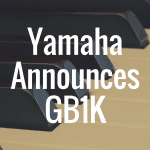 Some of the hammer action key systems offered by Yamaha are the Graded Hammer Effect (GH/GHE), Graded Hammer Standard (GHS), Graded Hammer 3 (GH3), Natural Wood (NW), and Linear Natural Wood (LNW). All of these options provide a different level of touch and key action, and it all depends on the user and the level of expertise to decide which is best for you. But as you can expect, natural wood is likely going to feel heavier and better compared to the action systems without natural wood. If you were looking for what will, most likely, feel or is deemed to be “the best” when it comes to key action, it would be the Linear Natural Wood, followed by the Natural Wood. After that, it would be the Graded Hammer 3 (GH3), the Graded Hammer Effect (GH/GHE) and the Graded Hammer Standard (GHS). It should be noted, however, that the Natural Wood keyboard has the same exact structure as the GH3 keyboard, but the white keys are all cut from natural wood. The black keys, however, are not. Also, the different sound engines provided by Yamaha are the Advanced Wave Memory (AWM) sampling engine, Real Grand Expression (RGE), and the Pure CF series. When talking about the best uprights that Yamaha has to offer, and the comparison between them, you always have to start with the ARIUS line of pianos. The ARIUS line is known for its exquisite wood cabinetry and also for their hammer key action systems, and this specific line was put together to showcase some of the best design concepts Yamaha has to offer. One upright digital in the beginner range is the Yamaha YDP-142. This piano has all the basics of what an ARIUS has to offer, with a full range of 88 keys supported by the Graded Hammer Standard (GHS) key action system and four levels of key touch sensitivity: hard, medium, soft, and fixed. The YDP-142 uses the Pure CF sound engine, which is the first generation in a series of legendary sound engines supported by real live samples from Yamaha’s concert CF grand pianos. It also has 128 notes of polyphony, a 3 pedal unit system, and USB to HOST connectivity. This piano goes for around $1100 online. A good comparison for the YDP-142, and a piano that fits perfectly into the intermediate player range, would be the Yamaha YDP-181. This piano, like the YDP 142, also has 128 notes of polyphony, a 3 pedal unit system, USB to HOST connectivity, and a full range of 88 keys. It is different, however, in that it is supported by the Graded Hammer (GH) key action system, which is just slightly different (and more improved, especially for intermediate and advanced piano players as it provides better accuracy for faster, repetitive passages). Also, the sound engine used is the Advanced Wave Memory (AWM) Dynamic Stereo Sampling, as mentioned before. The piano comes with 14 solid voices, variable touch sensitivity, 50 preset piano songs, and even a song recorder feature that works with the connectivity to be able to upload to different platforms. This piano certainly costs a little bit more, going for around $1700 online. In the advanced range, we have the ARIUS YDP-C71E. This piano features Yamaha’s Advanced Wave Memory (AWM) sampling system, which in a unique way features parts of the samples from the Pure CF system, along with Tone Escape outlet on the back of cabinet that works with an amplifying system to produce the best sound. It has the full 88 key range, supported by the Graded Hammer (GH) system, along with a special sliding key cover that fits nicely over the keys and keeps them in good condition. There are only ten tones on this machine, but a nice range of 128 notes of polyphony will support any kind of layering or dual/split features you want to use with the machine. This piano also has a dual headphone connection, which makes it easy for you and another person to practice at the same time or to work on a duet. Overall, it is a pretty impressive package for an upright that goes for an attractively reduced price of $1500 online. 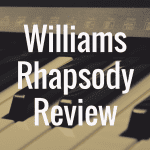 To get more information on excellent digital piano reviews, be sure to return to our website often for up-to-date information!